To tell you the truth, friends, I’m actually pretty busy working on something today. That said, I was asked to come and write something for all of you about the new follow-up to Luca Redwood’s 10000000 ($2.99). It’s called You Must Build A Boat ($2.99), and it’s every bit as compelling as the first game. Did you like the first game? Do you enjoy puzzle games? Do you like games? You’re going to want this one, trust me. The premise of the first game had you escaping from a prison by achieving a certain score. You had to eke out upgrade after upgrade, bumping up your multiplier in the hopes of making just a little bit farther each time. In this one, you’ve got nothing but freedom ahead of you. The only thing is, you need a boat. A little boat will do at first, but you’ll soon need a bigger one. To get the necessary resources, you’ll have to drop anchor and test yourself against the local wildlife. In doing so, you’ll collect gold, gather items, new crew members, and monsters, all of which will help you become stronger in one way or another. Once you’ve grabbed everything from one location, you’ll pull up the anchor and sail on. The game even keeps track of your time on each leg so that you can try to beat it again more quickly once you’ve finished. In terms of mechanics, the core hasn’t changed much. You’ll see your guy running across the top of the screen while you play on the lower half. You’ll have to slide rows and columns to match at least three of one type of piece in order to launch attacks, shore up your defense, or unlock chests. While you’re matching, the screen keeps on scrolling, and if you don’t clear out an obstacle before it scrolls you off the left side, you’ll win. Which is to say, you’ll take your rewards and head back to the boat. You can try again, of course, and you’ll need to play each stage several times to reap the rewards of completing all of the missions. Each stage is composed of a few different sections, and as you enter each one, a random modifier will be applied that ensures there’s always something new to deal with. Aside from switching to a level-based structure, the big change in the gameplay comes from a small but significant change to the mechanics. 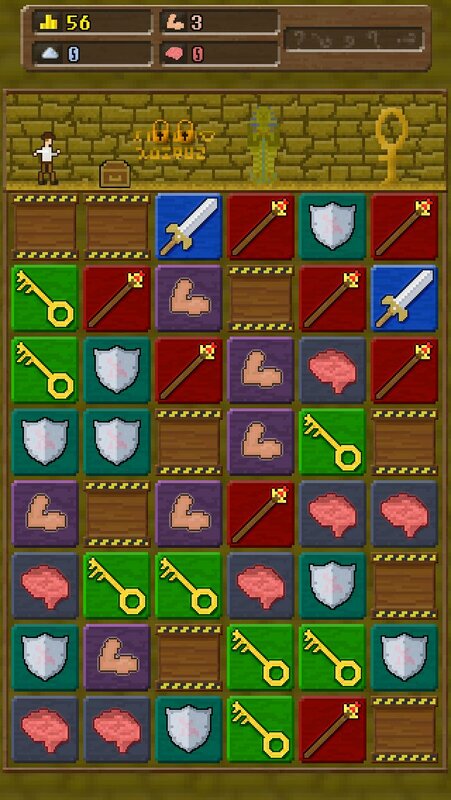 In the previous game, you couldn’t do anything while pieces were settling after a match. You had to wait for everything to fall into place before you took any other actions. This time around, you don’t have to wait. You can keep on matching even while pieces are clearing out and collapsing. In fact, you really must get the hang of this mechanic before too long. It increases the pace of the game quite a bit, making the game feel more hectic and action-packed than its predecessor. There are a couple of other new tricks too, like traps that you have to disarm by matching similar pieces or boxes that require you to match certain tiles to open. Items are used on the field now as opposed to being stored in a discrete area. It makes them easier to use. The other major changes are more in the background. Instead of hunting down natural resources as in the first game, here you’re collecting just a few things. Gold coins, which are used for just about every upgrade, are the most common resource and are earned by opening chests and beating monsters. Muscle and mind power are used to summon captured monsters, buy artifacts, and upgrade your magic. Summoned monsters will give you a passive bonus to one stat or another, while upgraded magic improves the effects of the spells you’ll uncover while playing. 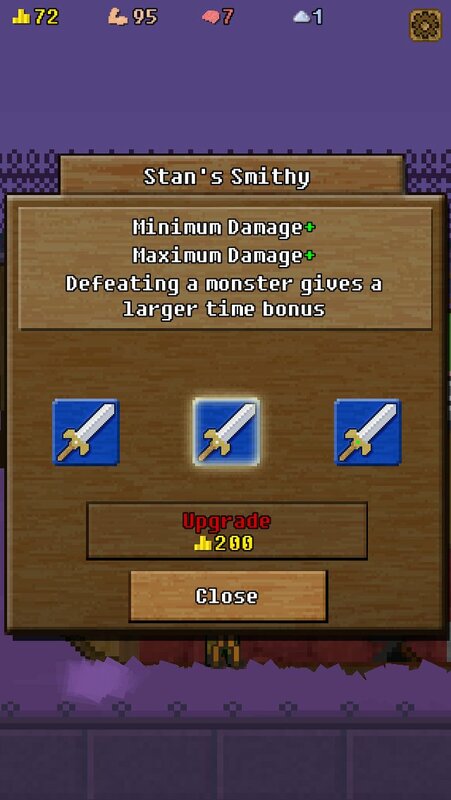 Once in a while, you’ll earn a bit of dust that you can use for extremely powerful upgrades to your sword and wand. And then there’s a litany of junk that you’ll just end up exchanging for gold. Your home base, the boat, feels a lot more alive than the castle in the previous game did. Any monsters you catch and summon will be rambling about on the decks, while new crew members will set up their own rooms where you can go visit them. There’s nothing fancy to catching the monsters, either. They’re given as rewards for completing certain missions, just as crew members and boat pieces are. You have to complete every mission to move on, but a scarcity of resources means you’ll have to pick and choose which upgrades and monsters you buy. It’s a lot of fun watching your boat grow from a humble river boat to a majestic galleon, getting packed with more and more creatures and odd characters. The presentation hasn’t changed all that much in style so much as in complexity. The visuals are still simple in form, the music still sounds like a lost Konami soundtrack from the 8-bit era, and so on. There’s the potential for a lot more happening on the screen at any given time, but the game looks and sounds like the follow-up to 10000000 that it is. The same, but a bit more detailed. The biggest gains here are in quantity. There are more enemies, backgrounds, and pieces of music than the first game had. A lot more, in fact. This variety helps spice up the game and makes it feel more complete. In general, that’s kind of what You Must Build A Boat is. It’s a more complete 10000000, offering so much improvement all around that it makes the original game feel like a demo. It’s absurdly fun and nearly impossible to put down. The considerably larger amount of content means that you should probably cancel your plans for the next couple of evenings, because you’re not liable to show up anyway until you’ve seen your way through to the end. It’s the kind of game that makes you wish someone would invent more efficient batteries so that you didn’t have to stop playing for a few seconds to plug a cord into the wall. Now, if you’ll excuse me. I must build a boat.